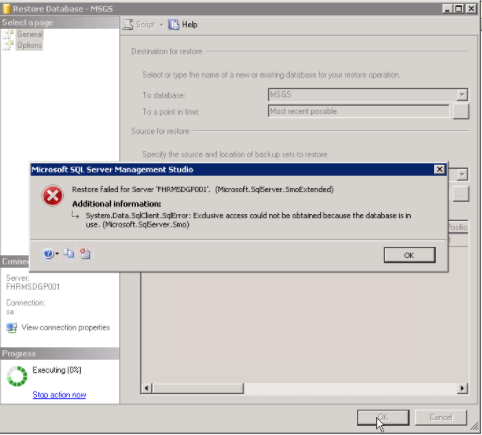 This Error Message Article explains the SQL Server error message “Microsoft SQL Server Management Studio Restore failed for Server “[Server Name]”…Exclusive access could not be obtained because the database is in use.” and details how to fix the underlying problem that caused it to appear. The action (in this case a restore) cannot be performed on the SQL database. The error indicates that the database is ‘in use’. In the situation that caused this error, we could not find a reason for the database to be ‘in use’. We stopped all services related to the application (TEKLYNX CENTRAL) that we could find that may have locked the database.